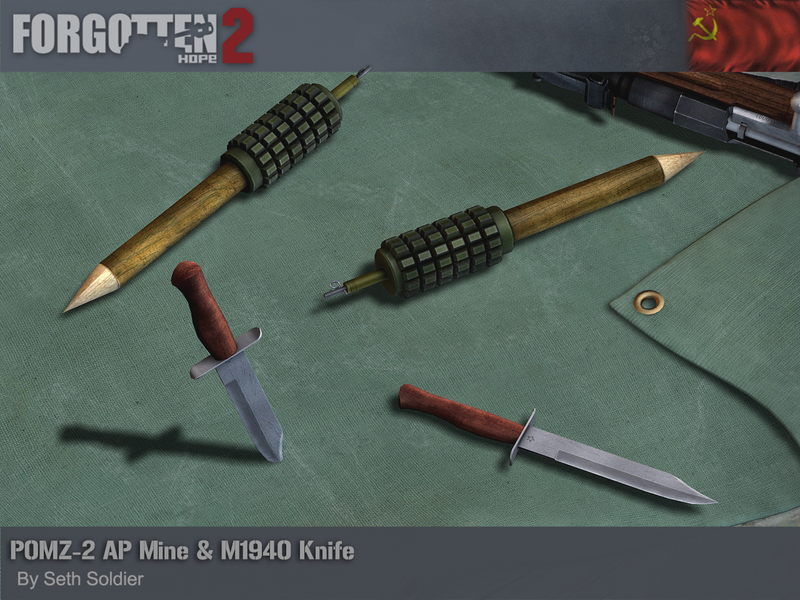 Today we are showing off some more of the equipment that you'll be able to use as a Soviet infantryman, the M1940 Knife and the POMZ-2 anti-personnel mine. The POMZ-2 is a very simple stake mounted fragmentation mine, typically triggered by a tripwire. It consisted of a cast iron body containing 75g of TNT, with a hole at one end for the fuse, and provision for a wooden stake at the other. The fragments could be lethal up to tens of meters away, but were usually quite unevenly spaced and a more conservative lethal range was about 4 meters. Copies of this mine are still found in use today. The Winter War had demonstrated to the Red Army both that they lacked an effective fighting knife, and that the Finnish Puukko was very effective in this role. The design of the M1940 or NR-40 took the Puukko and modified it to make it a more suitable fighting weapon. The cross piece is curved in the opposite direction to a more standard knife, since it was designed be held with the blade facing in. Both the M1940 and the POMZ-2 were made by Seth Soldier. Today we have a couple of renders of some equipment that you might find useful when the tanks come rolling in. 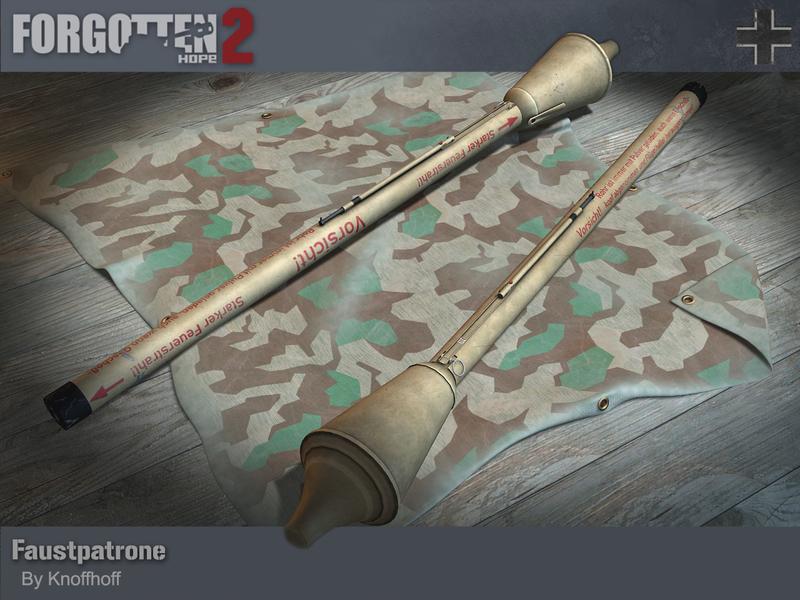 The Faustpatrone, the RPG-43 anti-tank grenade and the RDG-1 smoke grenade. The anti-tank weapons available to the Red Army at the beginning of the war were adequate against the panzers of the time. However, by 1943 they had largely been made obsolete by newer German tank designs with thicker armour. The RPG-43 anti-tank grenade was designed to replace the older RPG-40, substituting some of the explosives for a more effective HEAT warhead. To ensure the perpendicular hit necessary for the warhead to work, the grenade had a long fabric streamer that would stabilise it in flight. This was folded up under the metal cone, which was forced off by a spring when the grenade was thrown. 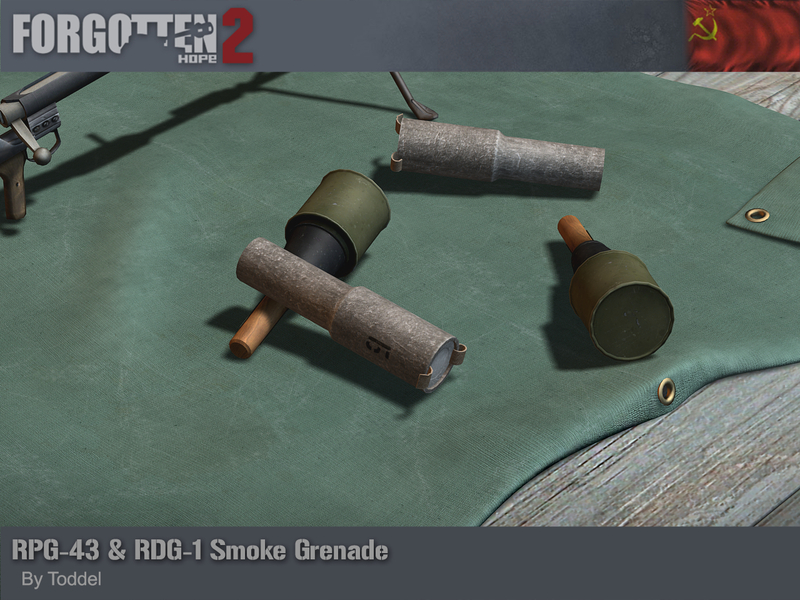 The RDG-1 was a very simple smoke grenade, manufactured from cardboard and wood and activated by hand with a friction igniter. It was designed to float and could be used on water. Both these Soviet grenades were made by Toddel. The Faustpatrone was the first recoilless anti-tank weapon developed in Germany. Development started in mid 1942 by the company HASAG, with the first batch delivered in August 1943. The first faustpatrones did not have any aiming sights, though these were soon added to the design. It had a range of about 30 metres, and the projectile would take a full second to travel that distance. When it arrived, it was capable of penetrating 140mm of armour. The later panzerfausts were developed to provide a more powerful and thus heavier warhead, but the faustpatrone still remained in production until the end of the war. Ours was made by Knoffhoff. Today we are showing renders of a couple of old friends from Forgotten Hope that we felt were of suitable quality to port across. 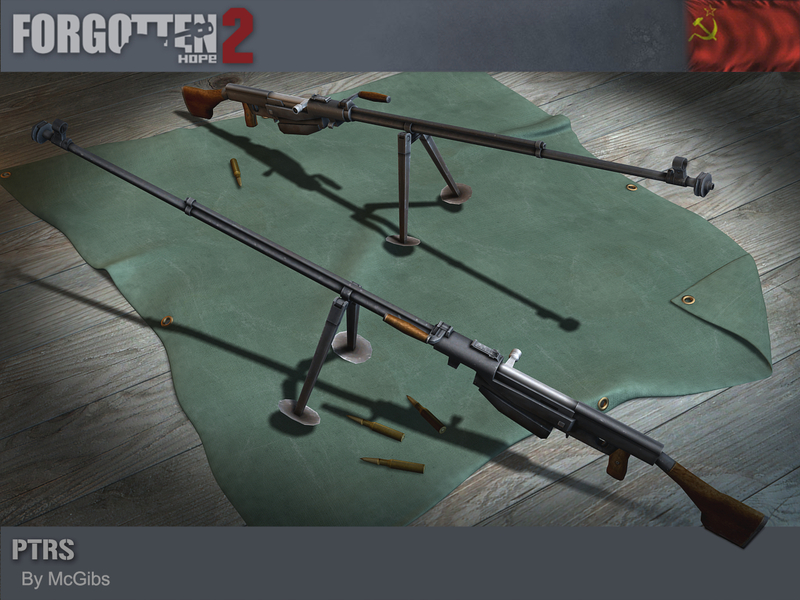 They are of course the PTRD and PTRS. The Red Army in the 30s had made some aborted attempts at producing an anti-tank rifle, but no real progress was made before the Invasion of Poland in 1939. The Poles had in the Wz.35 a capable weapon that was used against the light German tanks to some effect. 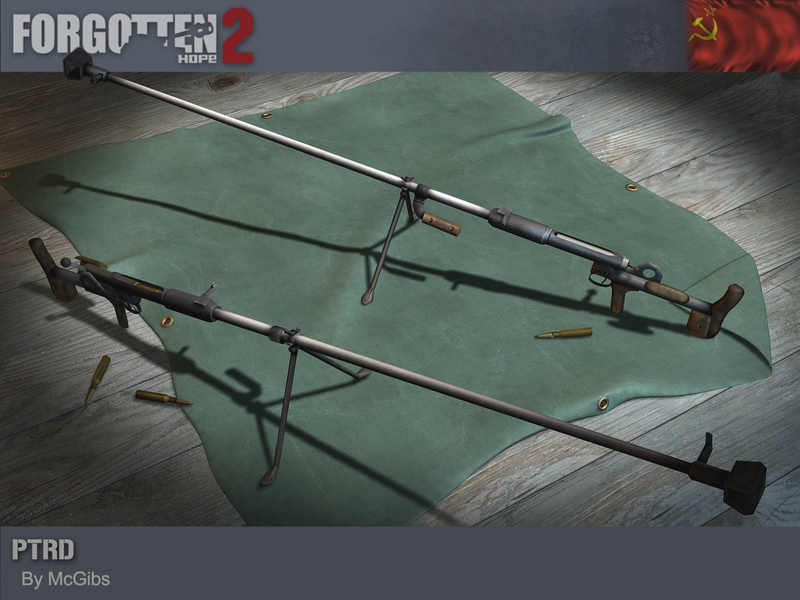 Following the fall of Poland, the Soviet Union captured a number of these rifles but did not make much use of them. The shock of Operation Barbarossa provided the urge to restart development of an anti-tank rifle. Both Vasily Degtyaryov and Sergei Simonov provided a design that was accepted into production, with the first rifles reaching the front by the end of the year. Degtyaryov's PTRD was the simpler of the two, and featured some elements of the Wz.35 and the Panzerbüchse 38. It was a single shot weapon, and unusually for a bolt action weapon was designed to automatically extract the spent case. The whole barrel recoiled into the stock, and the bolt was forced open by the protruding metal opposite the cheek rest. Simonov's PTRS used design elements from his SVT-38, and while longer and heavier than the PTRD, did have the advantage of a 5 shot magazine and semi-automatic action. It suffered from jams caused by fouling of the gas system and being generally more complex to manufacture, was eventually dropped in favour of the PTRD. In action, the 14.5x114mm ammunition with the BS-41 tungsten cored bullet was capable of penetrating up to 40mm of armour at 100 metres. This was more than sufficient to deal with the Panzers of 1942, but by 1943 the level of armour protection was starting to increase. The rifles remained in use until the end of the war, seeing use against APCs and hardened firing positions. About 190,000 PTRD and 60,000 PTRS were made during the war, and ours were made for the original Forgotten Hope by McGibs, with Toddel updating them to FH2 standards. Our winners for this week's screenshot competition is Leopardi. You can view the winning submission here. We are still accepting entries for the week of July 13th. If you think you have the best FH2 screenshot, post them here.